I intended for today’s post to be short – almost-wordless short. Really, it was just meant to be a recipe that I developed for a nut-free pâte sucrée. And that what it is, in essence. With a few notes around it. In France – or at least at the pâtisseries where I worked, and in books and magazines – pâte sucrée will always call for ground almonds (or some other kind of ground nuts, depending on the finished tart). This gives the dough a short, crumbly texture, and a wonderful roasted aroma. No questions asked. But here in Sweden, I’ve found that many people have food allergies, so I’ve had to improvise. And after many trials, I’ve finally worked out a nut-free recipe that I’m happy with, and that stands against the pâte sucrée I grew up making. Now, I could tell you a few stories about chefs that I worked with in London and their relationships with customers who have allergies or dietary requirements. But I think it would be 1) too mind-your-French kinda stories and 2) too long to tell them all. I must, however, share my favourite of all. Picture a couple of vegetarians asking about options in a very meaty menu. All I heard in response went along the lines of: “Do I go in a *insert swear-word of your choice* vegetarian restaurant and ask for a *insert swear-word of your choice* rib-eye?”. Of course, a beautiful vegetarian tasting menu was promptly made, but this sentence somehow stuck with me, and I love to remember it fondly every now and then, and of course, to tell it to anyone who cares enough (or not) to listen. This is the recipe that I started with. It’s absolutely beautiful – a given when it comes to Pierre Hermé, really. However, over the years, I’ve come to adapt it into an easier-to-work with dough; which to this day remains my standard and usual recipe. This recipe, which I think stems from a combination of Pierre Hermé’s, Valrhona and a few tweaks here and there, is as its name reveals without a hint of suspense, my favourite. It’s one I can make with my eyes and my recipe notebook closed. Of course, I always make a much bigger batch, somewhere along x5.5, which gives me enough to dough to roll fourteen 28.5x45cm sheets (a format, rather than being practical, obeys the rule of the baking paper that we have in kitchens: 45x57cm, which religiously gets cut in half in the morning, forming large piles that fit into gastros and baking trays, and lasts us through the day). For those of you wondering about regularity of thickness between sheets, read further down to Notes, where you’ll find the answer. When I realised many people here had food allergies, it made me question everything I had learn, heard or done in the past. In France, at least, back when I was living there, very few pâtisseries catered to dietary requirements; yes, [to be said with a French accent] eat the tart or don’t. It was not something I’ve ever seen anyone – chefs or customers – think about, let alone be concerned. In Sweden, it’s on the literal opposite of the spectrum, so much, that I always make sure to have at least three or four gluten-free options, two dairy-free alternatives, a couple of nut-free pastries, and a lactose-free crème brûlée (flavoured with tonka bean at the moment, because I think tonka and winter were always meant). And this is why I had to give up my favourite pâte sucrée. I started working on a recipe, with mixed results – from my perspective only judging by how quick the lemon tarts sell out every time I put them in the display. But after a few batches, I found the one that I’ve now been using for the past few months. A crisp, golden-brown crust that stays so. If you’ve never made pâte sucrée before, I can only recommend you to head over to my old blog foodbeam, where you’ll find a detailed step-by-step. 1. In the bowl of a stand-mixer fitted with the paddle attachment, cream the cold butter (see note n°1 below), icing sugar, ground almonds (if using), salt, and vanilla, until just smooth. 2. Add the eggs (and yolk for the nut-free recipe) one at a time, mixing well after each addition, a minute or so. If making a larger batch, the eggs can be added a couple at a time. 3. Mix in the flour (read note n°2 below if making a larger batch) and work on low speed until just combined. 4. Divide the dough into three pâtons, roughly 350-360g each. Flatten each onto a feuille guitare (cf note n°3) using the palm of your hand and top with another feuille. Roll, always from the centre upwards, giving the dough a quarter turn every time, into a large disk, around 3-4mm thick. Place the dough onto a baking tray and set aside. Repeat with the other two pâtons; and either freeze for up to two months, or chill in the fridge for at least two hours or for up to a week. If making a bigger batch, please refer to note n°4. 5. Line your tart ring and chill or freeze for an hour or two. Blind bake (see ressources below for a link to one of my posts “A few notes on blind-baking”). N°1. The butter does not need to be at room temperature as many recipes might suggest. Yes, it makes for an easier mixing (especially by hand, which I suspect this rather obsolete step comes from) but it also makes the water contained in the butter more available to bind with the flour proteins, hence developing gluten more than cold butter would. The quick mixing of the cold butter with the sugar acts as a mechanical (as opposed to physical) softener. And before you know it, you’ll have a smooth paste, ready to receive the eggs. N°2. If making a large batch – larger than 5 kilograms in total weight – I’d recommend adding around 10% of the flour to the butter/sugar/egg mixture and working on low speed until incorporated; and then adding the remaining flour and mixing until just combined. Never overwork the dough as it would make the tart shell tough instead of crisp and crumbly. N°3. Feuille guitare, litterally guitar-leaf, is a transparent polyethylene/acetate film that is somewhat rigid. Although it can be replaced by baking paper, I would – if given the choice – always use it to roll dough. It prevents the formation of creases in the dough (which could later results in cracks during baking) and yes, it looks neat. They are also amazing for chocolate décors, which i could show you if you’re interested (let me know!). N°4. When I make a x5.5 batch, I divide the dough into 14 pieces, around 450g each. And then roll them into 28.5x45cm sheets, making sure to trim the edges into a neat rectangle. This way, I can store my dough in the freezer in an airtight plastic gastro, and take out sheets when I’m making a tart shell mise-en-place. By weighing each pâtons and rolling to the exact same size every time, I ensure an even thickness throughout the batch. This produces a dough that bakes uniformly, making sure all the tartelettes on one baking tray will be ready at the same time. N°5. My absolute favourite rings when it comes to tarts are not the traditional tart rings that have rolled edges. I like simple entremet rings from Matfer. They’re 35mm-high and are completely smooth, with no welding mark. I find that with 35mm-high rings, I get more use out of them. If I want to make a 2cm-high tart, then I simply cut a 2cm strip of dough that will become the edges of the tart. However, if I’d like to make a deeper tart, perhaps chocolate or pecan, then I simply line the ring up to its rim. I know DeBuyer has recently come up with perforated rings in collaboration with Valrhona; and although I’ve tried them a couple of times, with great results in term on crumb texture and even baking, I don’t really like the marks they leave on the outer edge of the tart case. N°6. I always bake my tarts onto Silpain – a variation oriented for bread bakers of the now-famous Silpat. I find that it gives the quickest and most even baking. Just like I did in Paris Pastry Club (almost its two-year birthday!! ), I can’t resist to share the lemon tart recipe that has followed me for years – despite the MANY other lemon curds that I’ve tried to like. Of course, it’s from Pierre Hermé. And really, trust me, it’s the best you could, and will, ever make. The recipe will leave you with some extra lemon curd – that always tend to disappear on top of ice-cream if my mum and sister are around. Or you could also, divide what’s left in piping bags, tie them tighly and freeze for up to 2 months. Makes one 24cm tart, serving 12-16.
one 24cm blind-baked tart shell, using the pâte sucrée of your choice (or as I do in my book a lemon shortbread topped with a lemon sponge). Place the sugar and lemon zest in a large bowl, and rub the zest in the sugar for a minute or two. This step, although optional, diffuses the fragrant lemon oils into the sugar, resulting in a deeply flavoured and more complex lemon curd. Whisk in the eggs (I like to handblend the eggs before adding them to the sugar as I find it gives the smoothest texture) and the lemon juice. Set the bowl over a pan of simmering water and cook the lemon curd until it reaches 81°C, stirring every minute or so. remove the bowl from the bain-marie and allow to cool down to 55-60°C. Then whisk in the butter, one cube at a time. Handblend the curd for 6 minutes then pass through a fine-mesh sieve into a plastic container. Clingfilm to the touch and chill in the fridge for at least 4 hours or better yet, overnight. 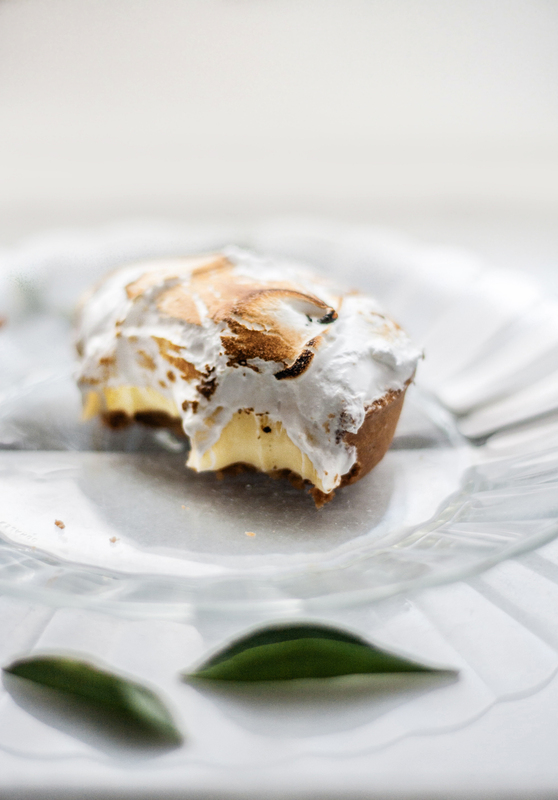 When ready to assemble the tart, make the Italian meringue. Place the egg whites and salt in the bowl of a stand-mixer fitted with the whisk attachment. Place the sugar and water in a small pan, and bring to the boil over medium heat. When the syrup reaches the boil, start whisking the egg whites on medium speed. Cook the syrup to 118°C and pour over the soft peaks egg whites, making sure to run the syrup along the sides of the bowl to avoid it from splashing around the bowl. Increase the speed slightly and keep on whisking until the meringue feels barely warm. In the meantime, pipe a generous layer of lemon curd into your blind-baked tart shell using a piping bag fitted with a 12mm nozzle. Pipe the meringue on top into a pattern, or simply pile it on and swirl. Burn using a blowtorch, making sure to rotate the tart to get every nook and cranny. – The way I roll pâte sucrée. – Where to buy feuilles guitare? They deliver in the north-north of Sweden, so I assume the rest of the world is ok! – A few notes on blind-baking tart shells. – My absolute favourite not-for-tarts-tart-rings: Matfer entremet rings (24cm for 14-16 portions or 8cm for indivdual tartelettes). For comparison: traditional tart rings. The DeBuyer/Valrhona perforated rings. Interesting, I wonder how it would be to use Rye in place of the Almonds. In that small amount it might lend a pleasant background note and being low in gluten shouldn’t affect the overall balance of the formula..
What a wonderful idea Janice – we make a nut-free pesto at the café using sunflower seeds, but I never thought of transferring this technique to baking! I will definitely try it.